WFDF's World Championships of Beach Ultimate (WCBU) were a success for the seven USA beach ultimate National teams. 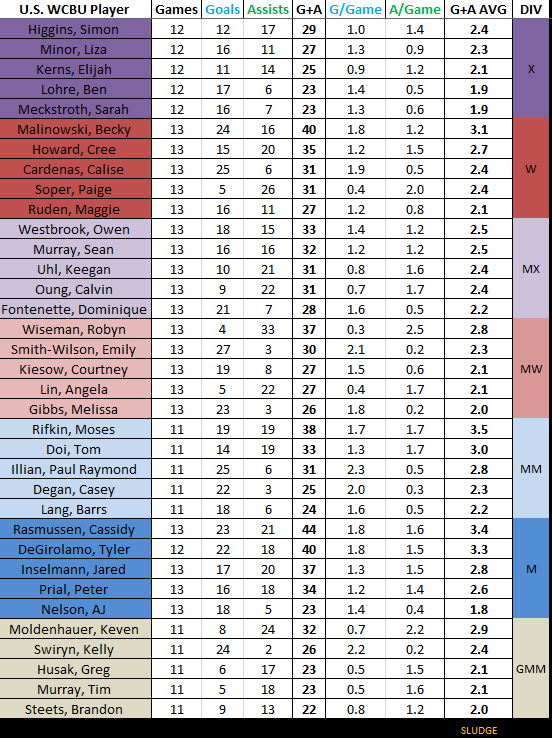 Updating earlier O stats using the provided WCBU data, here is a compilation of the offensive leaders for all the USA Ultimate teams in France. Today is the last day of Ultiworld subscription drive, which is 99% funded. Support Ultiworld's coverage of our sport. 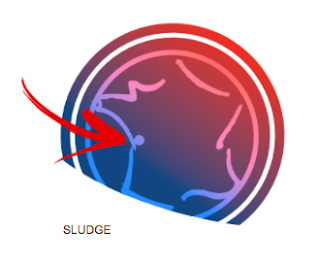 Sludge bought a subscription. YOU should too. Your support is vital to us. Really. And our revamped subscriptions offer much more than a video subscription: you get exclusive articles (like this one), a brand new members-only podcast, the chance to vote on games and article ideas, the ability to turn off ads and improve your site experience, and more. You can learn more and sign up right here. Thank you. Ultiworld is running its first-ever membership drive. 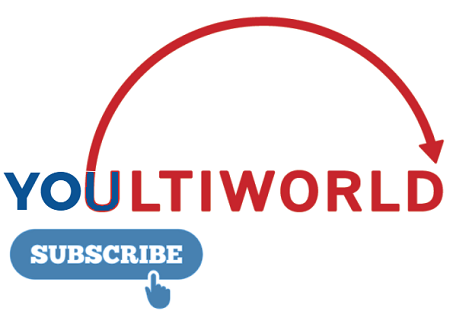 While historically we have covered our travel, equipment, editing, and other costs with video sales, Ultiworld needs more direct reader support in order to survive long-term as an independent journalism organization. Consider becoming a subscriber today! Congratulations to all U.S. National ultimate Team players, coaches and staff involved with winning a combined 8 medals - 7 gold and 1 silver - in France and in Portugal at WFDF's 2017 World Championships of Beach Ultimate. With sand-sational performances and achievements, you are deserving of a parade! Consider this your virtual ticker tape parade with color-coded confetti(refer to the key for each division). The social media experiment @being_ulti celebrates its 1-year anniversary today. The first account takeover occurred on June 27, 2016, and has been passed around for 50+ weeks and has posted 5000+ tweets. @being_ulti attempts to show the personalities and livelihoods of those that play ultimate. 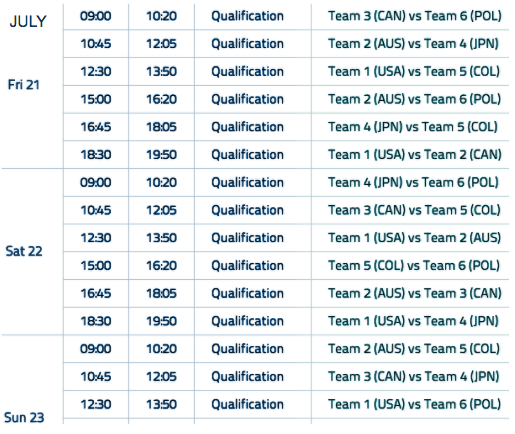 Btw how awesome is it that the @allstarulti games are available almost immediately after being livestreamed. Fo free. Want to takeover the account? Contact the admin. Seven (7) different countries medaled at the WFDF/BULA World Championships of Beach Ultimate in Royan, France. The United States led all countries with 7 medals - 6 gold + 1 silver - in the 7 divisions. Russia won their first ever gold medal at WCBU. All the US National beach ultimate teams advanced to their respective finals at World Championships of Beach Ultimate in France, yet the sweep was denied by the Russian team in the Women's division final. Overall, U.S. medaled in every division - 6 golds (men's, mixed, men's masters, mixed masters, women's masters and grand masters divisions) and 1 silver (women). Congrats to all U.S. players for their amazing accomplishment. Congrats to the inaugural World Great Grand Masters Beach Ultimate Championships 2017. Forty one different club teams are represented across the seven USA National teams competing at World Championships of Beach Ultimate. San Francisco Fury is the represented the most with 9 players. 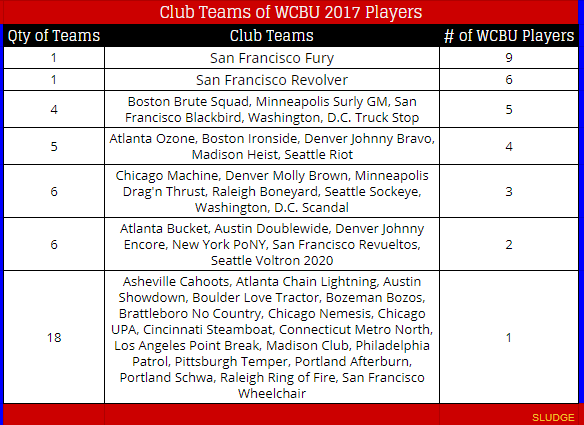 There are 23 club teams with more than 1 WCBU player, and 18 club teams with one WCBU player. 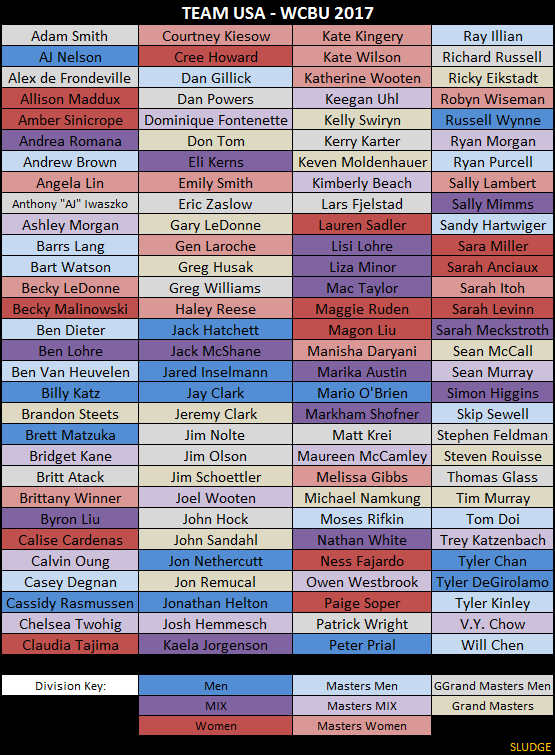 Follow the remaining beach ultimate games to crown the WCBU champs. Let's dig deeper about the logo for WFDF's 2017 World Championships of Beach Ultimate. Obviously, the blue-white-red logo colors match the flag of France. Also, the outline of France can be seen subtley etched in the disc shape. Moreover, the specific location of the international beach tournament - Royan - is embedded within the country's boundary. Royan is a seaside resort town on France's Atlantic coast -- look for the dot. The 7 U.S. beach ultimate teams at 2017 World Championships of Beach Ultimate are off to a hot start. Here is a current compilation of the top-3 offensive players on each U.S. divisional squad. 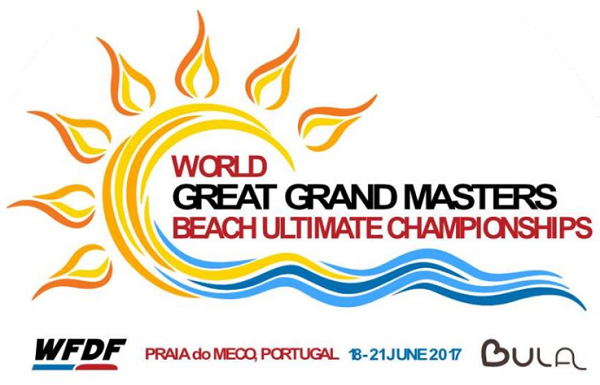 Concurrent to the World Championships of Beach Ultimate in France is the inaugural Beach Ultimate Championships for the Great Grand Masters division (48+ years old) in Portugal. 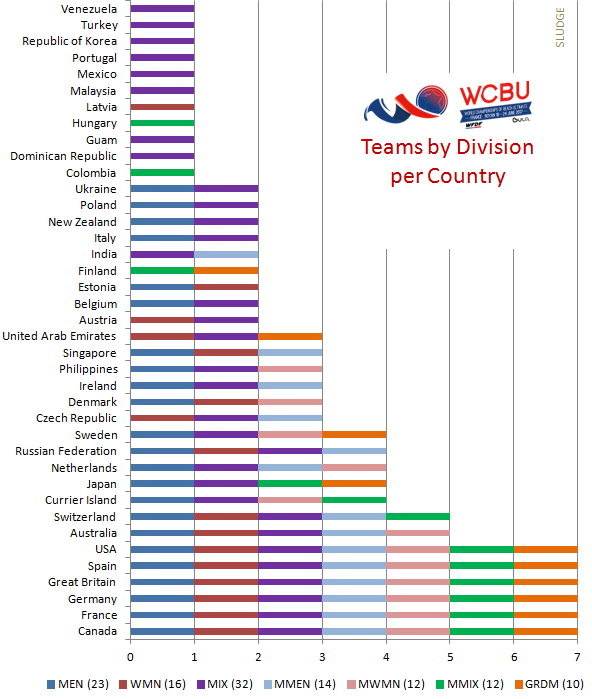 Six countries plus 3 additional teams from the Currier Island are competing at WGGMBUC: USA, Austria, Canada, Germany, UK, Sweden, plus CI Atlantis, CI No Borders and CI Americas. The international competition has begun in Royan France at the 2017 World Championships of Beach Ultimate. A total of 119 teams from around the world are playing beach ultimate this week at WCBU. 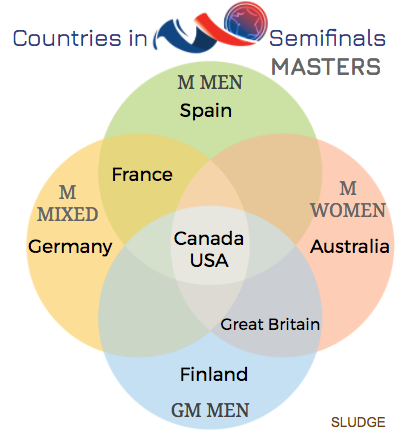 Six countries have teams participating in all 7 divisions: Canada, France, Germany, Great Britain, Spain, and USA. Thirty eight countries from five continents (plus the Currier Island) are represented at the 2017 World Championships of Beach Ultimate. Australia, Austria, Belgium, Canada, Colombia, Currier Island, Czech Republic, Denmark, Dominican Republic, Estonia, Finland, France, Germany, Great Britain, Guam, Hungary, India, Ireland, Italy, Japan, Latvia, Malaysia, Mexico, Netherlands, New Zealand, Philippines, Poland, Portugal, Republic of Korea, Russian Federation, Singapore, Spain, Sweden, Switzerland, Turkey, Ukraine, United Arab Emirates, United States of America, Venezuela. 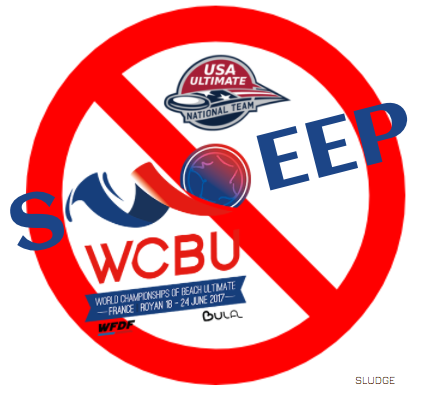 WCBU starts in Royan, France on June 18. 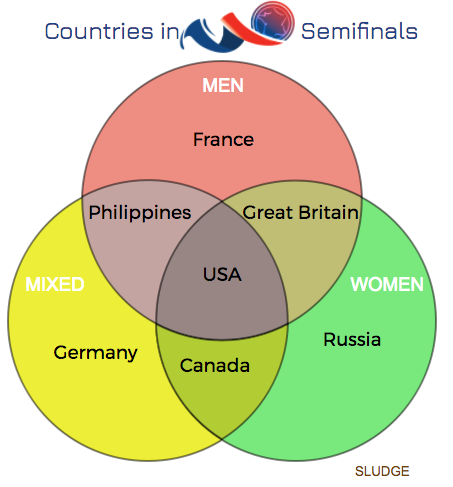 With WFDF's World Beach Ultimate Championships starting this weekend in France, it's important to note the recommended field size could vary depending on your preferred unit of length. The field consists of a 45 m x 25 m (49 x 27 yd) rectangle called the playing field proper, with a 15 m by 25 m (16 x 27 yd) rectangle called an endzone aligned along each of the 25 m (27 yd) sides. However the conversion from meters to yards is not a round number. The yardage specifications of a 5-on-5 beach ultimate field measure larger in all areas than presented by BULA. So, a beach ultimate specced out in meters, as regulated by WFDF and BULA, is smaller than a yardage field; and, a beach ultimate field measured in yards is larger compared to a beach field in meters. 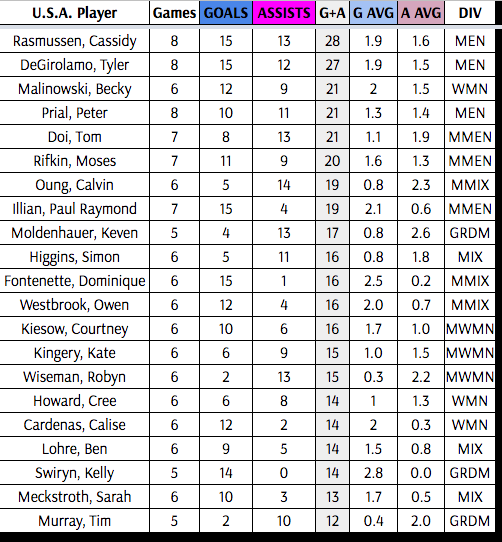 Above is the updated field size if measuring a beach ultimate field by yards. It might be worth for international players at WCBU to inquire whether their beach ultimate field is in meters or yards. Tickets to the flying disc competition at The World Games in Wrocław, Poland are now available. Tickets are being sold online via eBilet. a team game that combines elements of basketball, football, handball and rugby. The game involves two teams of seven members. The playing ground has dimensions of 100 x 37 meters, but the dimensions are subject to slight changes depending on the conditions and capacities of the organizers of the game. 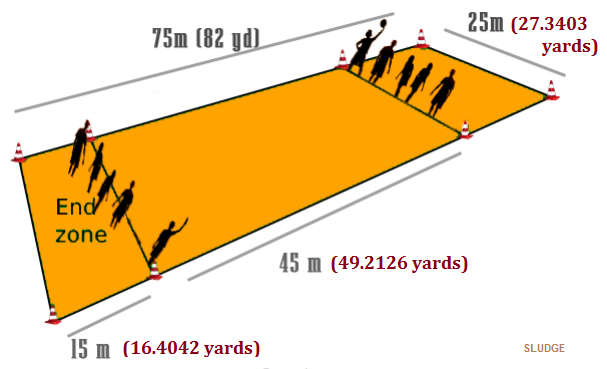 It is forbidden to run with the disc, and points are won if it is caught within an eighteen meter long "end-zone." One thing that distinguishes ultimate is the fact that are no referees in this game and all disputes are resolved by players in accordance with the principles of fair play. Players with high technical training can toss the disc unbelievable distances. The sport's governing body is the World Flying Disc Federation. The "Ultimate frisbee" event runs from July 21-23. 75,00 PLN (or $20.19 USD) pays for all 17 scheduled matches at Marsowe Fields, . 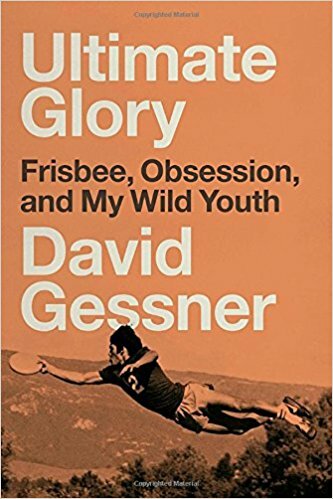 David Gessner's memoir, ULTIMATE GLORY, a story of obsession, glory, and the wild early days of Ultimate Frisbee has been published. You might remember Gessner from his essay about ultimate frisbee in 2012. Before he made a name for himself as an acclaimed essayist and nature writer, UNCW's David Gessner devoted his 20's to the sport of Ultimate Frisbee. Like his teammates and rivals, he trained for countless hours, sacrificing his body and potential career for a chance at fleeting glory without fortune or fame. 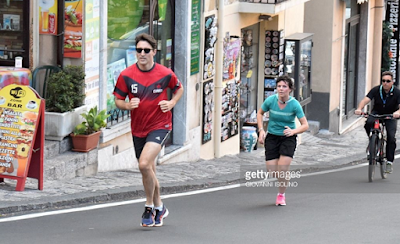 His only goal: to win Nationals and go down in Ultimate history as one of the greatest athletes no one has ever heard of. Gessner has said: "I had begun to form myself through Ultimate. Frisbee helped make me." David Gessner is the author of nine books, including the NYT bestseller "All the Wild That Remains." He has taught environmental writing at Harvard and is currently a professor at UNC-Wilmington, where he founded the award-winning literary journal, Ecotone. RELATED: Children's Book on Ultimate Frisbee . YA book on ultimate. It took a week for the grand prize winner to get paid five thousand and 00/100 dollars. 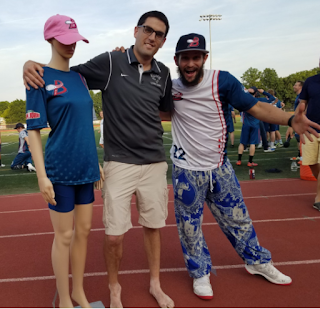 The winning $5k Toss was successful on Sunday June 4th, yet the only thing the winner could show for it was a mannequin dressed in Breeze swag. 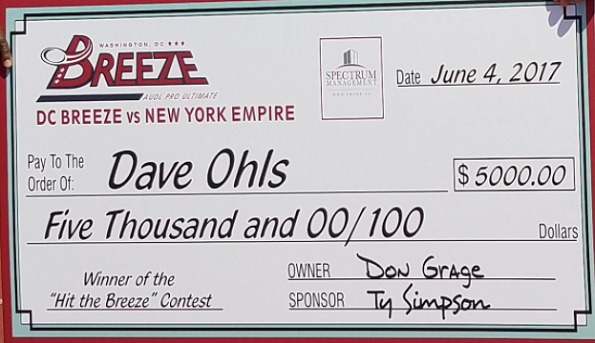 At the Breeze's subsequent home game on Sunday (another win against Toronto Rush), Dave Ohls was handed a big check - both in size and the amount. 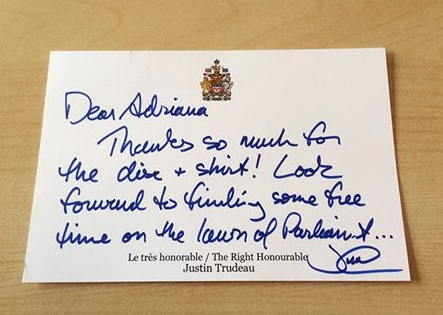 Interesting to note the check refers to the "Hit the Breeze" Contest," not the $5k Toss, which is now the #1kToss. The D.C. Breeze had their first back-to-back this AUDL season - a rare away game on Saturday then home game on Sunday. On Saturday, DC lost to Philadelphia for the first time since June 29, 2013. On Sunday, the Breeze won in sudden-death double OT over New York Empire. The story from Sunday's game was the big $5000 winning toss by a local high school coach. 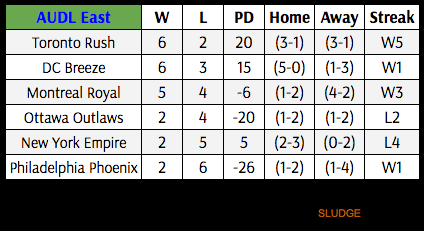 DC Breeze are (6-3) on the season and in second place in the AUDL East. DC hosts Toronto Rush on Sunday, June 11. 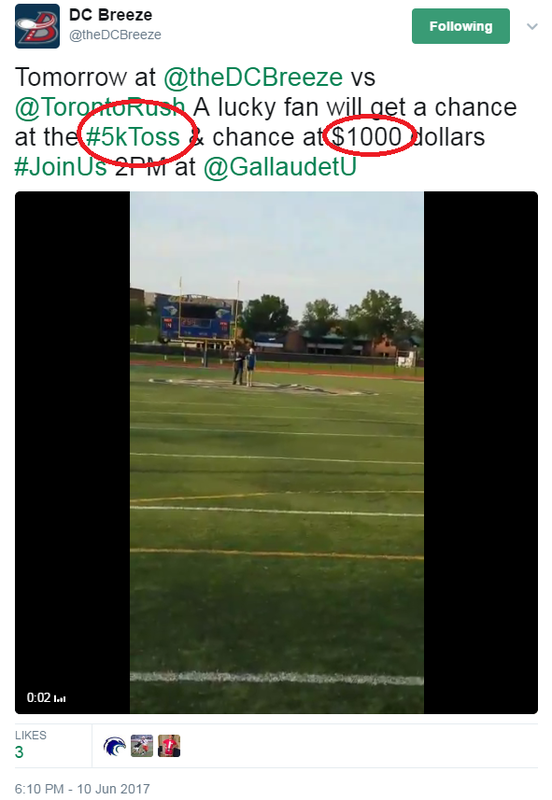 Two days after the details of the D.C. High School Ultimate Coach Winning $5000 at the D.C. Breeze game was published, The Washington Post attempted their own recap of the $5k Toss. WaPo's D.C. Sports Bog supplied exceptional coverage except for one minor detail - when the winning toss actually occurred. 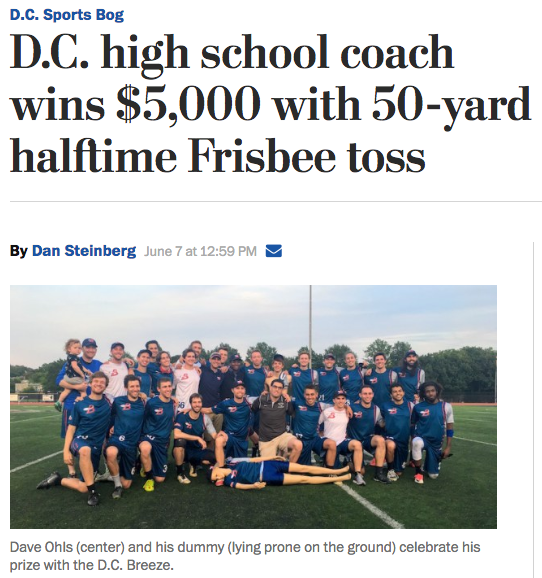 "D.C. high school coach wins $5000 with 50-yard halftime Frisbee toss"
"D.C. high school coach wins $5000 with 50-yard Frisbee toss"
This is not the first time The Washington Post has needed to correct an ultimate oversight. Hey, not everyone has the chops to be an ultimate frisbee blogger. The Minnesota Wind Chill are in first place of the Midwest Division with a perfect record of (7-0). Going into Week 11 of the season, Minnesota is the only undefeated team in the AUDL (24 teams). Five of the Wind Chill's seven wins have been home games; there are seven more games remaining in the regular season. Their next game is another home game versus Madison Radicals on June 10th. As you may have heard a local high school ultimate coach won $5,000 at the D.C. Breeze game on Sunday. The winning toss happened in before the start of the 4th quarter - not halftime. 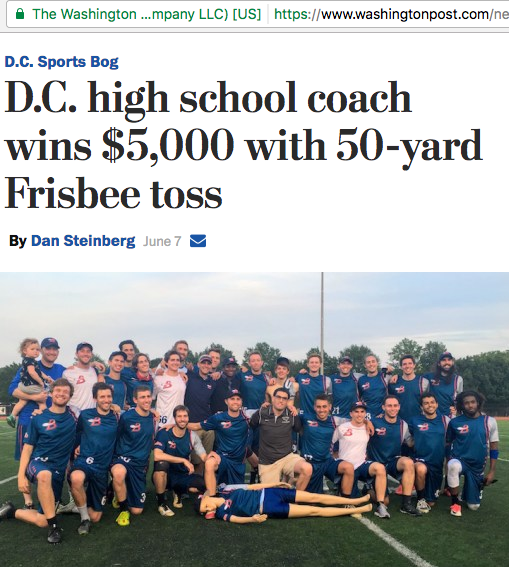 Today (June 7), Dan Steinberg wrote a recap of the promotion in The Washington Post's D.C. Sports Bog - D.C. high school coach wins $5,000 with 50-yard halftime Frisbee toss. The club thought that a win in this challenge would be good: exciting for fans, thrilling for the winner, possibly noteworthy enough to entice an extremely bored and depressed local sportswriter into covering a stunt at an ultimate Frisbee game. Don Grage, D.C. Breeze managing partner: "We didn't think anybody would, to be honest. It's not too easy to hit a little mannequin from 50 yards...we were very happy to give away this prize...we thought it would be just great for the sport, great for awareness and exciting for the fans." Dave Ohls ($5000 winner): "I'm not an elite level player, but I'm one of a set of people who could potentially do it. That's where I am in the hierarchy of Frisbee." Before Justin Trudeau became the Prime Minister of Canada, he was involved in ultimate frisbee. 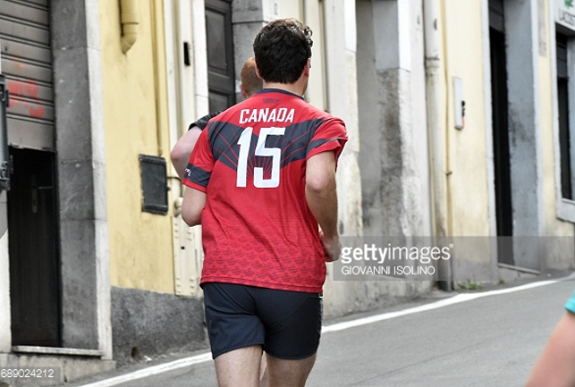 PM Trudeau was recently photographed wearing a Team Canada ultimate jersey that was given to him by Canada-based VC Ultimate back in 2015. 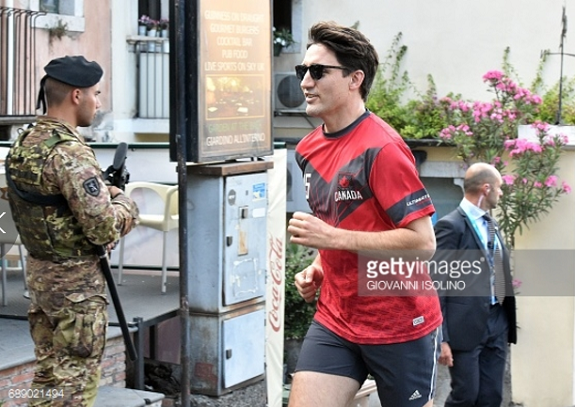 May 2017: Canadian Prime Minister Justin Trudeau jogs in Sicily after a G7 Summit. 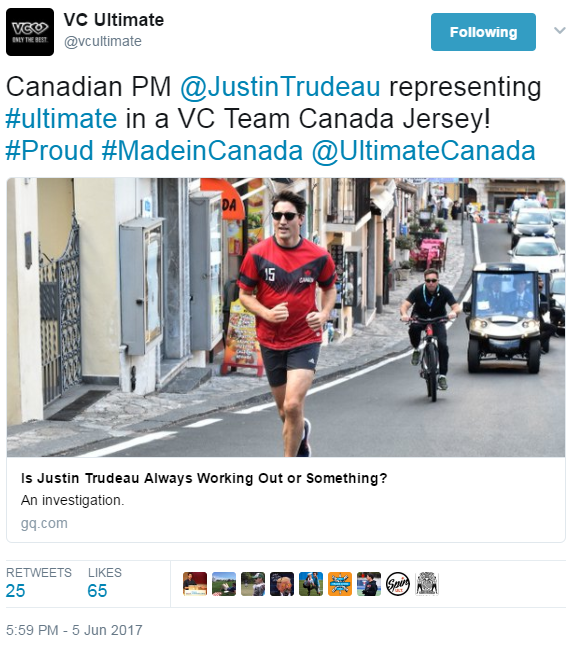 June 2017: A GQ article uses a photograph of PM Trudeau wearing Team Canada ultimate jersey. 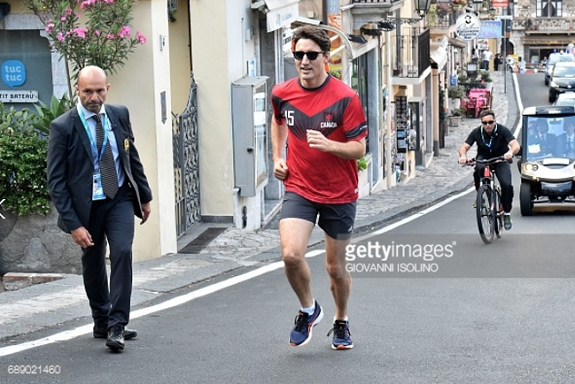 The VC Ultimate jersey worn by Canadian PM Trudeau was the official red jersey of Team Canada uniform from 2015. 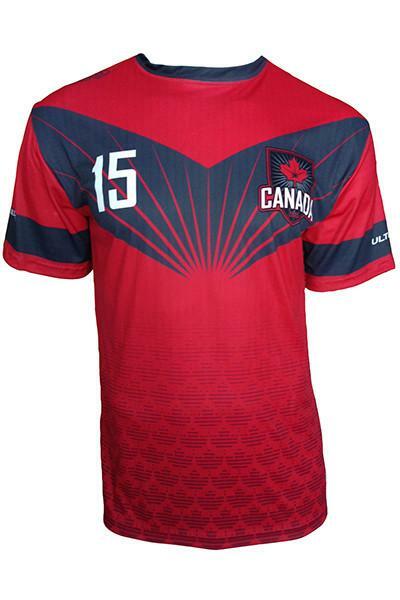 The short sleeve jersey is available in red, white and black for the price of $74.00 (CAD). The D.C. Breeze debuted their $5kToss promotion at home games for this 2017 AUDL season. After 5 games in they already have a winner. The rules are simple: a contestant has three chances of hitting targets - mannequins wearing DC Breeze swag - with a Discraft Ultra Star (AUDL's official disc). First, the contestant must throw and hit the mannequin on the fly with a throw from 5 yards away as a gateway to the next 2 options. With any remaining discs left, the contestant can choose to run downfield and throw again from 25 yards away at another target for a DC Breeze fan pack and/or throw from 50 yards away to win the grand prize...$5000! On Sunday, during the break between the 3rd and 4th quarter of DC's game versus New York, a contestant threw a forehand 50 yards that hit its target to win FIVE THOUSAND DOLLARS! The contestant is a former Carleton College ultimate player with nearly 20 years of playing ultimate. Dave O is the ultimate coach at Wilson High School where the Tigers have won multiple DC state championships. The DC Breeze would also win...the game; an 18-17 win over New York in double overtime. 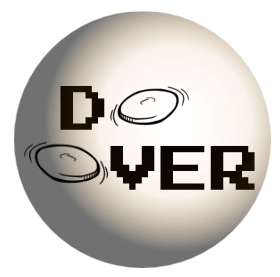 As a generalized equivalent, Dave's $5000 winning = a D.C. Breeze player's pay after 200 AUDL semi-professional games. 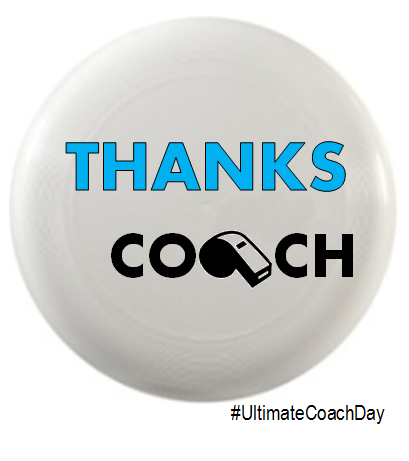 Today is Ultimate Coach Appreciation Day! If you are an ultimate player lucky enough to have a coach or coaches on your team, then today's the perfect time to reach out them. Go ahead and thank or honor those individuals who encouraged and guided you as an ultimate player and, possibly, as a person. Ultimate coaches are hardworking individuals who dedicate time and effort - sometimes even sacrificing their own ultimate playing opportunities - to coach competitions for the sport of ultimate. Take time today to show your appreciation of ultimate coaches. 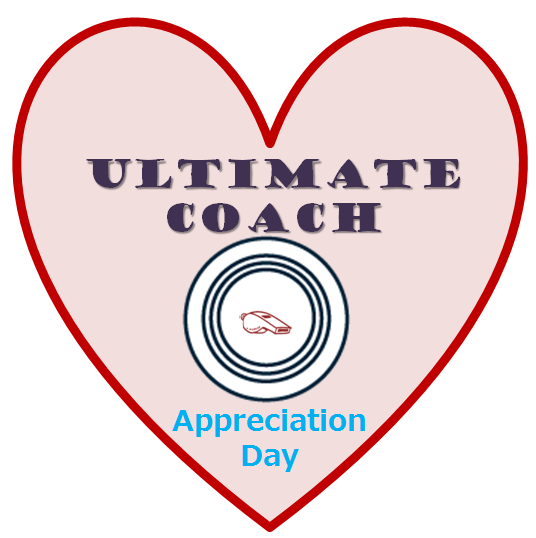 Want to celebrate Ultimate Coach Appreciation day? Post an appreciative message on social media, and @ your coach. Use the hashtag "#UltimateCoachDay" so everyone can follow the conversation. Copy and post any of these Ultimate Coach Appreciation Day images into your social media. Design your own image for Ultimate Coach Appreciation Day and post it somewhere online. Hug your coach (if you see them in-person). Send a thank-you email or text to a coach of your current or former ultimate team. Why celebrate Ultimate Coach Appreciation day? Join this grassroots movement to recognize these essential contributors to the sport of ultimate. Ultimate is not an NCAA-sanctioned sport (yet), but don't let that stop universities to celebrate their school's ultimate teams winning a championship. The D.C. Breeze played another close game versus New York. DC's had a 4 goal lead in the 3rd quarter. After New York tied it at 23's, the Breeze outscored the Empire 5 to 2 for the 3-point win. This was the D.C. Breeze's first win on the road of the season. 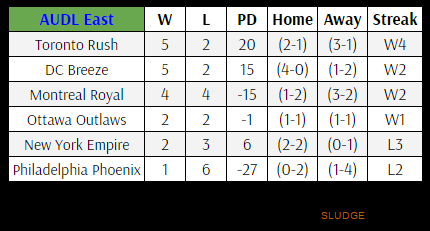 DC Breeze are (5-2) on the season and are in 2nd place in the AUDL East. DC play in their first back-to-back games this AUDL season; away at Philadelphia on Saturday, then home versus New York Empire on Saturday, June 4. ESPN continues with ultimate "Games"